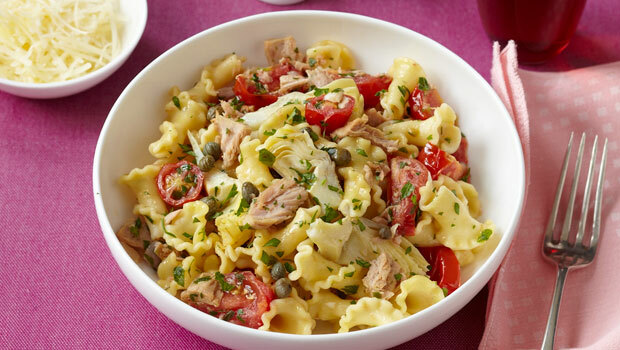 This recipe is modified from the Parade magazine by Giada. 1. Bring a large pot of salted water to a boil over high heat. Add the pasta and cook, stirring occasionally, until tender but still firm to the bite, 8 to 10 minutes. Drain, reserving about 1 cup of the pasta water. to soften, 8 to 10 minutes. 3. Put in the pasta, the remaining oil, and the parsley. Toss until all the ingredients are coated, using a little ­pasta water, if needed, to thin out the sauce. Season with salt and pepper to taste. Transfer to a large bowl and serve warm or at room temperature.